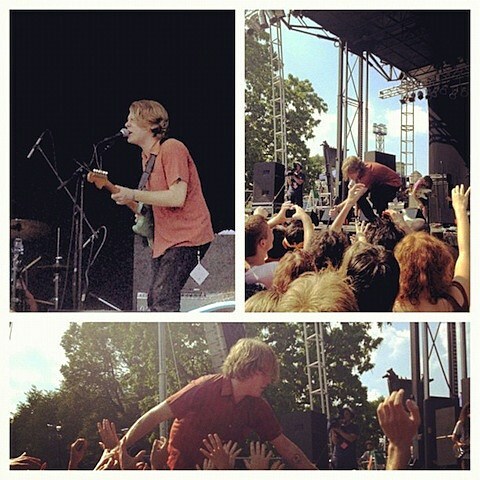 As seen on BrooklynVegan, Thee Oh Sees and Ty Segall will be touring together this fall. Both acts hit Chicago this past weekend to play shows at the Empty Bottle and to perform at the 2012 Pitchfork Music Festival (pictures are forthcoming). They’ve now added a September 28 performance at the Logan Square Auditorium to their tour. Tickets are on sale now. UPDATE: Tickets go on sale to the general public this Friday (7/20) at 10AM CST. Ty’s new album and third this year, Twins, is due out on October 9 via Drag City. Thee Oh Sees also have a new one, called Putrifiers II, coming out on September 11 via In the Red. You can download Putrifiers II‘s lead single “Lupine Dominus” HERE. All Thee Oh Sees/Ty Segall dates are listed below, with a video of Ty & co. at the Bottle.